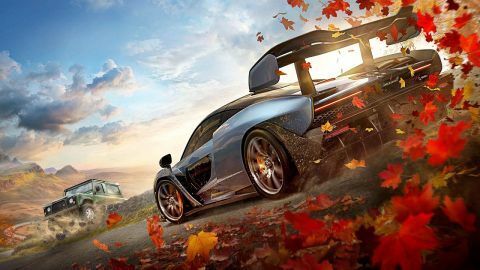 Forza Horizon 4 review: "A challenging and all-encompassing online racer"
Forza Horizon 4 isn’t as bombastic as its predecessor, but still a challenging and all-encompassing online racer. And the more introverted moments of driving through autumnal or snow-dusted Britain are beautiful, especially as a showcase for Xbox One X.
Britain is an unlikely location for the Horizon Festival to grace with its presence. You can almost feel the politeness as you zoom through the beautiful countryside, like someone’s already asked everyone if they could ‘turn it down a little bit’. There’s still a radio full of music straight from the dancefloor, but there’s also a sense of fawning over autumn leaves and historic bridges and buildings. And the roads are unrealistically free of traffic and pedestrians, making for an eerily quiet game world. Where has everybody gone? As an Englishman myself (and I appreciate that familiarity is possibly the problem), I’m comfortable in saying: it isn’t exciting enough to sustain a whole game. England’s a bit of a buzzkill. Location aside, the template here is near identical to Forza Horizon 3. You can drive pretty much anywhere you can see in this online game world, and smash through any obstacle that isn’t a fully-grown tree or a building. Shrubs, fences… even dry stone walls are fair game to careen through like they’re made of cardboard. For every event you complete, about another three pop up, from eye-popping off-road races to drag strip sprints, all stacked into tiers. While the game constantly tells you it’s removed drivers who didn’t make the cut, and that the next level will be really tough, nothing ever actually changes. The Drivatars on the grid still have the same names above them, the tracks feel no more devilish, and there’s very little sense of progression in anything outside the stunt driver story events. Fortunately, simply driving around and soaking up the wonderful seasonal views is a very pleasurable experience. Winter’s my favourite (the snow is so pretty), but they all have something of value that adds to both the visual appeal and the gameplay. Naturally, this being one of Microsoft’s biggest games of the year, it’s a graphical showcase for Xbox One X. With 4K visuals in HDR and at 30fps, it looks incredible - especially in lush forests, where there’s very little pop-in despite the dense foliage and sprawling backgrounds. These same visuals arguably look even better on a 1080p screen, as supersampling removes the majority of jagged edges, making for magnificent picture quality. However, if frame-rates are more your thing, you can switch to 60fps on Xbox One X, reducing the resolution and edge smoothing (it gets noticeably more shimmery like this), but it does move like greased lightning. Even though I love 60fps gaming, I actually stuck with the higher fidelity. It just looks so good. As with Forza Horizon 3, there are Showcase Events to really show off the game engine and give you a more thrilling, curated experience. Highlights include racing the Flying Scotsman locomotive, and a giant hovercraft that smashes its way through the scenery ahead of you. One later event I won’t spoil, but suffice to say long-time Microsoft fans will absolutely love it. Between these and the stunt driver storyline, there’s a reasonable amount of high-quality, scripted content, but it’s far outweighed by hours of glossy but skin-deep busywork, stretching out the experience. The game even prefers you to drive everywhere rather than fast travel - there’s a rather severe 9,000 credit penalty for moving around the map, presumably as it wants to avoid tangible load times as much as possible. If you knuckle down and race to win, you’ll likely find the first year of seasons flying by, and it will only take some 7-8 hours to unlock the ‘Horizon Pass’. This doesn’t end the standard game, but it does effectively split it into two halves. The first - before you earn the pass - is the casual Forza player’s playground, where you’re still able to challenge other gamers to a race or get them to join your convoy and co-op certain events, but essentially plays like an offline game (in fact you can - if the server goes down, you don’t get booted to the title screen. That’s awesome). But post-pass gameplay is where the online aspect really kicks in. After this watershed, the map becomes populated with other Horizon Pass holders and the PvP offerings really open up. You’re given extra, seasonal championships to attempt, there’s a quarry full of multiplayer party modes like King of the Hill, and also Forzathon Live - a server-wide co-op event comprising three challenges (such as speed traps, score attacks, jump distances), with a bar that fills cumulatively as the participants play. The online events aren’t what I’d call riotously fun - in fact it can feel very trivial - but messing around with a group of mates was always fun in Burnout Paradise, and Forza Horizon 4 gives you everything you need to do that, if it’s your bag. After this milestone in your progress, the time of year becomes fixed for all players, remaining constant in the game world for one week of real time, before moving on to the next. You can still set up Blueprint events with specific times of year (and day) which let you enjoy the visual variation and other gameplay benefits (like frozen bodies of water, slippery mud and so forth) without waiting up to three weeks before you can see it again. Blueprinted events can be named and shared as with Forza Horizon 3, and are just one of the familiar community features in the game. Cars can be bought and sold at auction, liveries designed, downloaded and loved/disliked, and there’s even a basic chat feature on the d-pad, for saying hi or telling someone they have a ‘nice car’. Cute. What’s less cute are options to spend real money on cars, treasure maps and more through the Microsoft Store, and new emotes that you can win on the prize spinner, which - when coupled with ludicrous outfits - make for painfully cringeworthy pre- and post-race taunts. It’s totally at odds with the solemnity of the location and feels crass. I blame Fortnite.